Can you believe there are people who would charge you for a barcode font like this? It took very little time to make this so I thought I'd donate it to the world. It is suitable for scanning even at fairly small point sizes. I have tested printed copies of this font with a couple different scanners and it worked perfectly. Two versions of 3 of 9 are included. 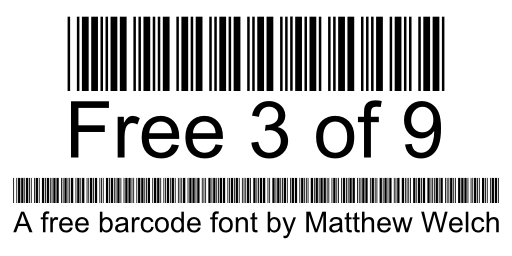 The font called "Free 3 of 9" is the basic 3 of 9 standard. It includes letters and these symbols: $ % + - . and /. The font called "Free 3 of 9 Extended" implements the extended 3 of 9 standard. It includes all the ASCII characters. Most of these extended barcodes are included.